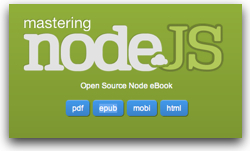 Mastering node is an open source eBook by node hackers for node hackers. I started this as a side project and realized that I don’t have time 🙂 so go nuts, download it, build it, fork it, extend it and share it. If you come up with something you wish to contribute back, send me a pull request. It is a good start on a book… and if anyone out there wants to add to it and help fill out the contents, he’s obviously open to that assistance. This entry was posted in Books, Node.js and tagged Node.js on February 22, 2011 by Dan York. This server has received 5726967 hits from both ipv4 and ipv6.